INSTALL instructors are an essential piece that make the INSTALL program what it is. 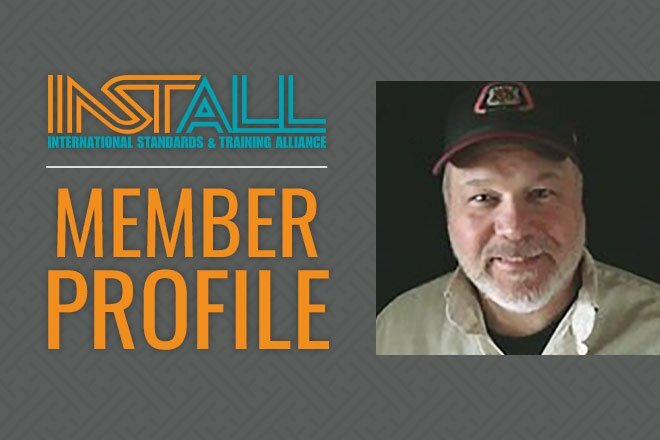 David Gross, an INSTALL instructor in New Jersey, feels lucky to be able to work with INSTALL and provide apprentices the training they need to build a lifelong career. Gross teaches any and all flooring related courses under the INSTALL curriculum as well as some crossover courses to carpenters such as OSHA and Infection Control Risk Assessment. One of the biggest challenges trainers encounter is developing a lesson plan that integrates all apprentices as it is not uncommon to have a class representing different skill levels. Gross noted that keeping up with his own training courses has helped him develop his training skills and prepare for these classes. Gross attends train the trainer courses at least once a year and up to four times a year for new coursework or to earn upgrade credits. Recently, Gross along with INSTALL Representative Frank Koch and Training Director Thomas Sommers hosted Sika Corporation at the Thomas C. Ober Carpenters Training Center in Hammonton, NJ to review INSTALL training and curriculum. Following this, Sika became an INSTALL Partner. “We rely on David and INSTALL Northeast’s participation in everything that we do at INSTALL.” says INSTALL Director John McGrath.